Delivering the Promise of Social Outcomes — joint-published by Social Investment Lab in Portugal, Impetus-PEF in the United Kingdom and Think Impact in Australia — highlights the increasing importance of social performance analysts in making data on social programs “more meaningful and useful”. The report provides evidence that rather than cutting funding for administrative spending, service delivery organisations should be considering greater investment in back office capabilities. 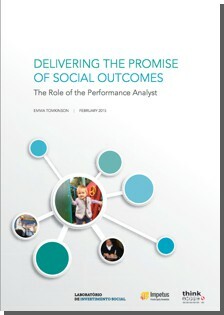 Initially, says author and social impact analyst Emma Tomkinson, research was aimed at figuring out “the critical features of a great case management IT system”, but it became apparent that the key to successful social service organisations was the relationships between its performance analysts and service delivery staff. “Over and over again, people told stories about the positive feedback loops created between stakeholders, rather than the answers provided by their IT system,” she said. The idea of “collective impact” is rapidly gaining traction due to its requirement that organisations collaborate to deliver social outcomes. Inflexible contracts and overly proscriptive donors are common barriers to sensible program adjustments, as well as media and outside evaluators who “penalise” charities for spending on administrative costs and overheads. “On a regular basis, we also conduct customised analysis on the service. Sometimes this is conducted for managers or investors, but often it’s requested by delivery staff. They might say to us “can you compare the success rate of my clients who received residential support in comparison to those who did not.” We can provide this information. “Analysis of data will suggest changes to the service at all levels. For example, an analysis of the times that missed appointments were scheduled might suggest that some days of the week are worse than others. When adjusting the service, you should always assume that people are reluctant to change, particularly people on the ground, so you need to bring them along. You need to show them the benefits of the change, whether it be better access to information, responding to client need, less time inputting data. The report and further resources for implementation are available at the Delivering the Promise website.